Hi everyone. Jasmin Singer here. 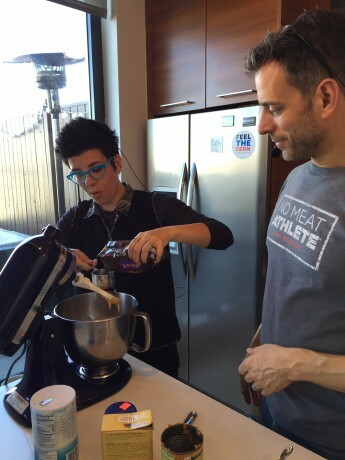 Join longtime vegan Jasmin Singer as she finally figures out her way around the kitchen. 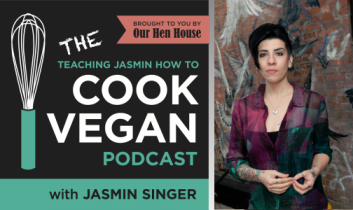 With the help of some outstanding chefs, cookbook authors, and foodie friends, Jasmin will learn how to master the art of making some simple, yet scrumptious, vegan meals. And — trust us — if Jasmin can do it, anyone can. For our very first episode, you are in for a huge treat! 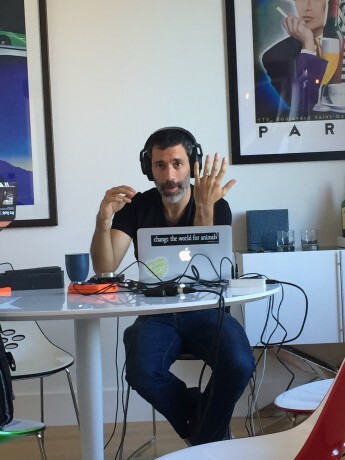 I am joined by none other than the incredibly talented and witty Michael Suchman — of one of my favorite blogs, Vegan Mos. Michael, of course has been a regular on the signature Our Hen House podcast (now over 300 episodes old! 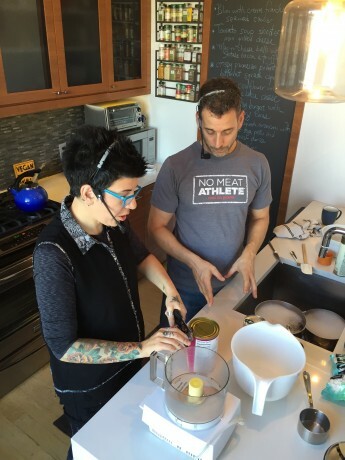 ), where he has been joined by his husband Ethan Ciment (the other half of Vegan Mos), to review countless cookbooks. 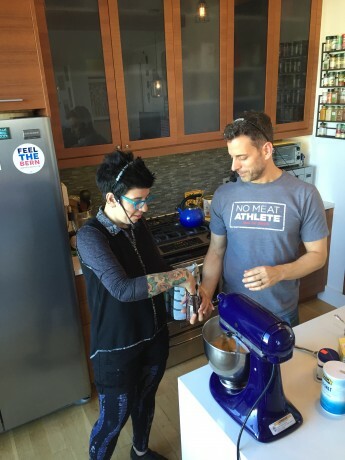 I adore Michael, and have come to rely on him to be my vegan-food-emergency-sponsor (he has, more than once, been on the other end of the text when I needed a hand figuring my way out of my current cooking conundrum or catastrophe). 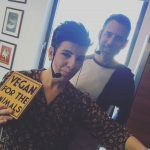 Not only am I thrilled that Michael is the first guest on the Teaching Jasmin How to Cook Vegan podcast, but — if I have anything to say about it — he’s going to be a regular guest! Jasmin and Michael. Photo by Ethan Ciment of Vegan Mos. On this inaugural episode, Michael is here with all of his best, most Jasmin-friendly Thanksgiving recipes! He also offers ideas on veganizing the holidays in general, as well as a whole slew of insider-tips on everything from baking, to how to serve a life-changing meal to your vegan-curious friends with style. 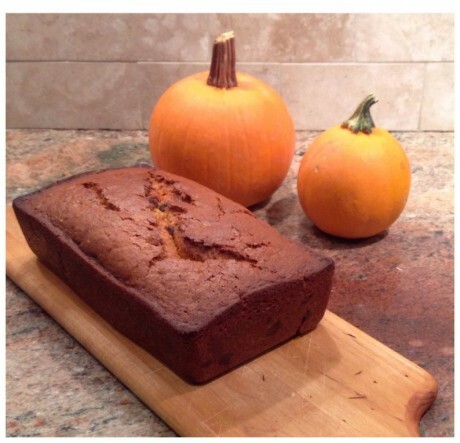 Today, we will be making vegan French Onion Dip; Sweet Potato Casserole; and Pumpkin Chocolate Chip Bread. 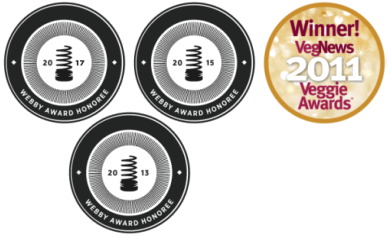 Below, you’ll find those recipes, which were created exclusively by the Vegan Mos. We are giddy that the inaugural episode of Our Hen House’s Teaching Jasmin How to Cook Vegan podcast is being sponsored by Dandies Vegan Marshmallows. 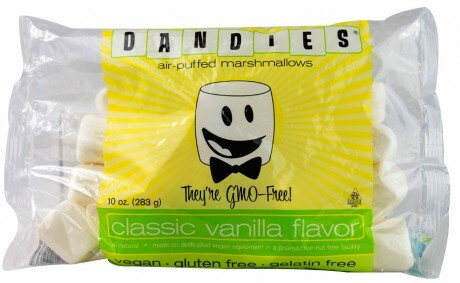 Dandies Marshmallows are all natural, vegan, and Non-GMO Project verified. They are cruelty-free, and made without gelatin. Enjoy Dandies in s’mores, crispy treats, hot cocoa, or straight out of the bag! 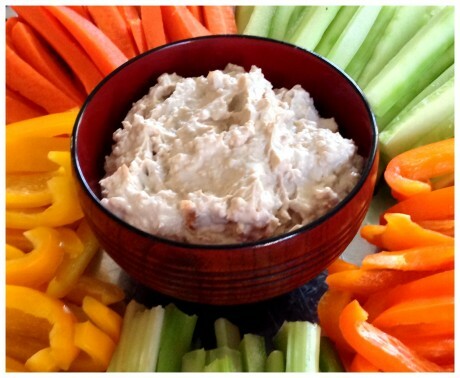 Learn more at chicagoveganfoods.com. Note that the recipes below are doubled-versions of the ones that were featured on Episode 1 of the Teaching Jasmin How to Cook Vegan podcast. Put all the bullion cube in a bowl and use a fork to break it up. Add the remaining ingredients and mix thoroughly to combine. Serve immediately, or cover and keep in the refrigerator until you need it. If you make it ahead of time, take it out of the refrigerator about 15 minutes before servicing, allow to warm up a little bit, and give it a good stir to smooth it out. Jasmin and Michael. 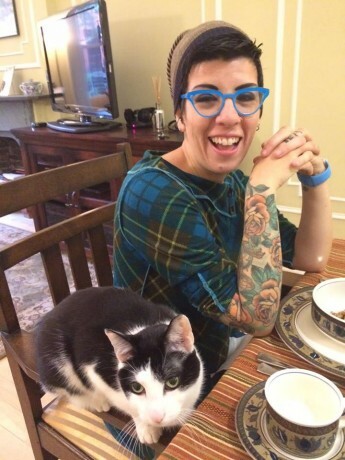 Photo by Ethan Ciment (of Vegan Mos). Put yams and mandarin oranges in a food processor and process until smooth. Pour into a large mixing bowl. Add brown sugar and crushed pineapple to the yams and mix thoroughly. Taste the mixture. If it is too dry, add the reserved pineapple juice 1 TBL at a time until the desired consistency is reached. Put half the mixture into the prepared casserole dish. Cover with marshmallows. Top with remaining yams. Bake uncovered for 30 minutes. Remove from oven. Cover top with remaining marshmallows. Return to oven for 10 more minutes or until the top is lightly browned. Removed from oven and allow to cool slightly before serving. Pre-heat oven to 350 F. Lightly grease 2 9×5 bread pans, or 1 tube/bundt pan and set aside. In a large mixing bowl, combine the sugar, oil cinnamon and pumpkin. 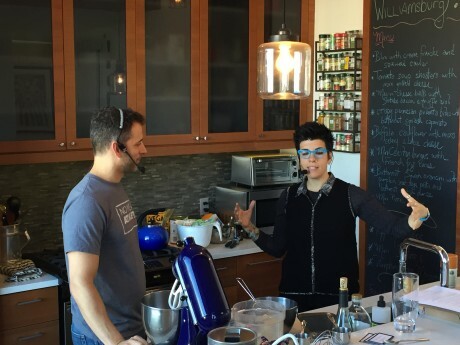 Mix with hand mixer or stand mixer on medium speed until evenly blended, about one minute. Alternately add the dry mixture and the water to the wet mixture, a little at a time on lower speed. Add a bit of the dry, then a bit of water, then dry, then water, etc… until all of the dry and the full cup of water are mixed in. Gradually increase the speed to medium and mix until thoroughly combined, about 2 minutes. Add the chocolate chips, and nuts, if using, and mix at medium for another minute. Bake at 350° F for 40 minutes for loafs, or 1 hour 10 minutes for a tube pan, or until a toothpick comes out dry from the center. That’s Eric Milano, our editor! Photo by Ethan Ciment of Vegan Mos. 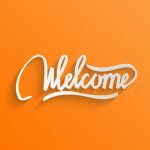 Help Us Cook Up More Episodes!